“What am I going on about?!”. Most of you will probably be tempted to go on Youtube and search for a funny cat video soon if I continue blabbering on. I SHALL STOP. My name is Sarat Rakngan, and I am currently studying my Masters Degree in Mobile Media Communications, under the Euromasters Program. This two-year MSc Program is quite different from a usual one-year course which is a norm here in the UK, because for my Second Year, I will be doing a six month placement program before my actual final dissertation project. I will go in depth about this Euromasters thing in my later blog. So how did I end up here, in this beautiful community that is Guildford? Surrounded by the wild rabbits and green kangaroos… Okay maybe those were just Deliveroo’s drivers. My journey to the UK started back in my Bachelor’s Degree, where I studied Electrical Engineering at Thammasat University, Thailand (ในโพสต่อๆไปอาจจะมีการเม้ามอยไทยคํา อังกฤษคํา ไม่โกรธกันนะ). The 2+2 Program at Thammasat gave us the choice to study the latter two years of our degree at either the University of Nottingham in the UK or the University of New South Wales in Australia… It is safe to say that I am not surfing at Bondi Beach or getting treated to the classic “Aussie Aussie Aussie, Oi Oi Oi!” right now. The Famous Bondi Beach. In Australia Of Course. The last 2.5 years here in the UK has flew by so quickly, exactly the same feeling I had watching Star Wars: The Force Awakens. “Why can’t we have just a little bit more Luke. Whyyyyyy!?”. Anyways, I still the remember how I felt when I arrived here for the first time. One of things that I found to be a huge difference between the UK and Thailand is the public transportation system. My fellow Thais, if you are reading this, you will share my opinion. Everyone agrees that commuting around the streets of Bangkok is, let’s say not the safest thing in the world (บอกเลย ถ้าเกาะสาย 8 นั่งไปแฮปปี้แลนด์โดยที่ไม่ล้มได้อะ ไปสมัครทีมอเวนเจอร์เหอะ). In the UK however, road accident rarely occurs, and their public transportation is (for the most part) a pleasantly pleasant experience. Another thing I was not used to at all during the first few weeks here in the UK is the weather. THE. CONSTANTLY. CHANGING. WEATHER. In the morning you could go outside and be impressed by the sunny sky and relaxing bird chirping lullaby, only to find that 15 minutes later, rain cloud has gathered and ready to strike. And later that night, hailstorm will erupt and the god of Thunder will summon himself and gives a massive speech to the people… Maybe I am exaggerating a bit, but the weather is always changing. So a quick advice for all the students who are packing their bags right now, a good rain coat is never a bad idea. I have always known that I was going to continue with my Masters Degree right after I graduated from Nottingham. For me, studying is fun, and I still couldn’t get enough of what I have learned from my BEng Degree. 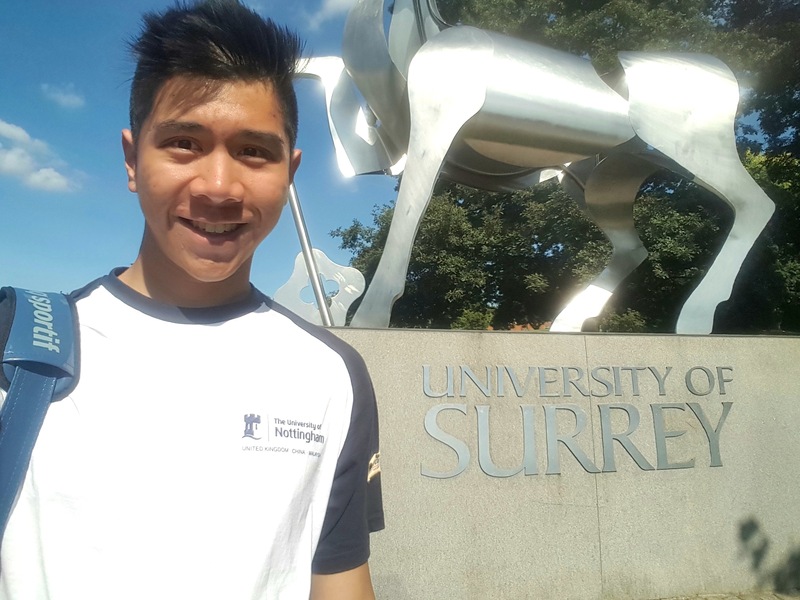 So how did I end up here in the University of Surrey? It was certain that I was going to pursue my career in Electronic & Communication Engineering . Therefore it was important that any university that I pick has all the criteria I consider essential for my further development in the engineering profession. Reading about the incredible facilities and choices of courses Surrey offered in my specific field, there was no way that I could choose any other university over this one. 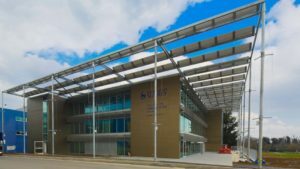 The Electrical and Electronic Department alone has four BUILDINGS tailored for distinct research areas – The Advanced Technology Institute, Institute for Communication Systems, The Centre for Vision Speech and Signal Processing, and Surrey Space Centre. Moreover, our rankings are amongst the top universities in the UK in this specific field, and we have been voted both ‘University of the Year’ and ‘University of the Year for Student Experience’ in The Times and Sunday Times Good University Guide 2016. Pretty Impressive Huh? Now, as for how to end with a bang? Well, that’s another blog post for another time. And as the great Arnold once said, “I’ll be back”. Welcome to my first blog !